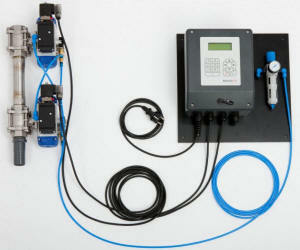 A Sampling system from pressurized lines up to 25 bar. both ball valves are normally closed. ball valve 1 and ball valve 2 is filled with sample medium. Ball valve 1 is closed again. the sample can drain off into the sampling bottle. connected to the pressurised line. Working like a standard Vacuum-Sampler Because of pre- and post-purge of the connectionline between pressurized line and sampling-device the “dead”-volume” is almost zero. Available either as a wall mounted version or even with stainless steel housing with cooling and distributor for multiple bottles.